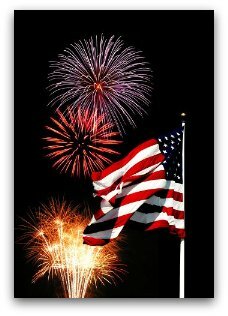 The 4th of July – celebrated as Independence Day in the United States of America. As I pondered on an appropriate patriotic post for this most important and meaningful American celebration, I began to consider our Founding Fathers and what led them to declare their independence from the British monarchy in 1776. There were a long series of perceived injustices that led the colonists to become unhappy with Mother England. The seminal event often viewed as the beginning of the American Revolution was the Boston Tea Party. In 1773, the British Parliament passed the Tea Act, imposing a tax on tea arriving in England and in the American colonies. In some of the other colonies, protesters were successful in preventing the unloading of ships carrying taxed tea, and the ships sailed without having unloaded their tea cargo. In Boston, however, Massachusetts’ Royal Governor Thomas Hutchinson refused to allow the tea to be returned to Britain, as had happened in the other colonies. To his great surprise, rather than allow the tea to be unloaded and thereby acquiesce to the authority of the British Parliament to levy taxes upon them when they had no direct representatives in that body, the protesters destroyed the tea. 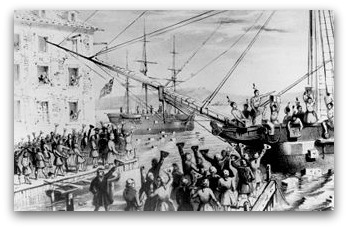 On December 16, 1773, the ships were boarded, and the taxed tea was dumped overboard into Boston Harbor in what has come to be known as the Boston Tea Party. More than simply an objection to taxes, the colonists’ primary objection was to a tax being imposed on them by a body in which they had no representation. They questioned the extent of Parliament’s authority in the colonies, and saw the imposition of the tax without any ability to have a say in the matter as a dangerous infringement of their rights. The Tea Act had granted a monopoly on (legal) tea trade in the colonies to the East India Company, and the colonists were concerned that this government-created monopoly might be extended to other goods in the future. The British Parliament responded the following year with the Coercive Acts, which, among other things, closed Boston Harbor to commerce until the British East India Company was paid for the destroyed tea. Further protests followed, and the First Continental Congress was convened. It petitioned King George to repeal the acts. He did not, the crisis continued to grow, and the Revolutionary War began in 1775. There is growing talk in America today that it’s time for another revolution, one designed to “take our country back” and return it to the principles established by our Founding Fathers. 21st Century King George III? It seems to me that the sweeping legislation passed by Barack Obama and his Democrat-controlled Congress has placed Americans once again in the position of taxation without representation. We have elected representatives in Congress, but in the months since Barack Obama became President, those Congressional representatives have ignored the voices of the people they were elected to represent. Instead of representing their constituents, they have followed their “dear leader” in a zombie-like trance, doing whatever he bids. Their blind adherence to following their “dear leader” despite the clear directions of the people they represent has resulted in the passage of legislation that more than tripled the American budget deficit in 2009 alone. The budget deficit for 2009 was $1.4 trillion, slightly more than triple the $458.6 billion deficit in 2008. The national debt held by the public was $5.8 trillion at the end of 2008, and increased by 30 percent to $7.5 trillion at the end of 2009. Had Obama’s first budget been enacted as originally proposed, the CBO projected that the national debt would have increased to $11.7 trillion by 2019, about double the $5.8 trillion in 2008. The 2009 deficit was about nine times the 2002 and 2007 deficits, when Republicans controlled the White House and at least one chamber of Congress, according to CNN. And that’s BEFORE the passage of the gargantuan HealthCare Reform bill in 2010, which was opposed by roughly 75% of Americans. The Obama health care plan is disturbing in many ways. One is the mammoth amount it will cost, which can only be paid by taxes. Although the taxes kicked in immediately, the full effects of the legislation will not kick in until safely AFTER the 2012 Presidential election. If you think that’s an accident or coincidence, wake up and smell the coffee. Another is the fear that it will result in a significant decrease in the quality and availability of health care for most Americans. And, in a flashback to 1773, there is a legitimate concern that it will result in not only a government-created monopoly on health care (after forcing private health insurance companies out of business), but a government-run monopoly at that. So I set out to see if anyone else had compared Obama to George III. Not surprisingly, I am not the first patriot to have this thought. That’s as far as most of us can go. In fact, that’s the second paragraph, not the first. “– That whenever any Form of Government becomes destructive of these ends, it is the Right of the People to alter or to abolish it, and to institute new Government, laying its foundation on such principles and organizing its powers in such form, as to them shall seem most likely to effect their Safety and Happiness. “Prudence, indeed, will dictate that Governments long established should not be changed for light and transient causes, and accordingly all experience hath shewn, that mankind are more disposed to suffer, while evils are sufferable, than to right themselves by abolishing the forms to which they are accustomed. “But when a long train of abuses and usurpations, pursuing invariably the same Object evinces a design to reduce them under absolute Despotism, it is their right it is their duty, to throw off such Government, and to provide new Guards for their future security. Then Thomas Jefferson set forth for the world the tyrannical actions of King George III. The next American Revolution has already begun. Like the colonists, patriots will once again rise to decry tyranny and to drive out the tyrant. I only hope that the revolution can be contained within the ballot box, and that it is not necessary to replenish the Tree of Liberty with the blood of patriots. 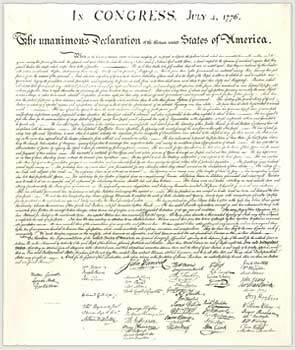 So, on this Independence Day, take a few minutes to reflect on your freedoms, which began with this powerful document, were further set forth in the Constitution and Bill of Rights, and which have been secured by the blood of the men and women of the U.S. Armed Forces for the past 236 years. Say a prayer of thanksgiving for the courage and wisdom of our founding patriots to devise the most successful form of government ever created upon the earth, and for the courage and conviction of those patriots who have preserved and defended your freedom for 236 years. Make a vow to join today’s patriots in once again driving out tyranny and re-establishing the principles upon which this great republic was built. Happy Birthday, America. Happy Independence Day. And thank you to all those men and women who have worn the uniform of the United States Armed Forces for your dedication to service and preservation of freedom.